I’ve read most of your books, I’ve never been so absorbed and captivated by each of your books. They have been unputdownable and addictive to read. Keep up the good work. I wish your the best for your future I’m sure you will write more engrossing stories. Thank you, Zarina. That’s very kind. Absolutely amazing books! I’m half way through ‘the fear’ and can’t put it down! You’re a superb author! Thank you, Anna. That means a lot. Dear Cally. For the first time I’ve just read one of your books – The Missing. I found it completely riveting. I love your writing skills, your emotional intelligence and your wisdom. Two passages in particular really spoke to me and I’m going to write them down. ‘We all have secrets, most are guilty, a few are wretched and some are too precious to share’. Then – happiness is in the here and now…..cherish every moment’ etc. Thinking about the whole secret thing, I see that its possible to waste your life agonising over whether or not you should share a particular secret or whether you would feel nothing but a sense of being diminished, of self betrayal. Once its out, its out, can change lives – yours and others. So many brilliant novels are built around secrets of different kinds. Maybe you could write us another novel with another take on the subject and call it The Secret? I’d be queueing up at the bookshop to read it. All the best, Cally and congratulations on being so good at your job. Wow, thank you, Liz. What an incredible comment. Thank you. I’m very touched that you picked up on the little bits of philosophising in The Missing. I am sure I’ll explore secrets and their power and ability to wreck devastation in another of my novels one day. Take care and thanks again for taking the time to leave me a message. Cally. Can’t wait to read The Lodger!just love your books,all such gripping reads!thankyou. I hope you enjoy it, Sally. Thanks for your kind words about my books. I have read all of your books and did I read somewhere you were bring out a new book this May? or was I just hoping you were so I could take it on holiday with me!! Sorry Gail, the next book is ‘Sleep’ and it’s not out until 10th January. Oh dear, what am I to do!! I will put the date in my diary so I don’t forget. Thank you for letting me know, can’t wait til January! I’ve finally caught up, and finished all your books so far. I’ve loved every one of them so far. I am really looking forward to your next one. Keep them coming. Your writing is amazing. Thank you. Cheers Nik, so glad you’re enjoying my books. I’ve got all your books and very enjoyable it’s a skill trying to work out the physiology on how did it . Just got back reading in the last mth after mam died aged 94. The lie was hard going but got there in the end with missing very enjoyable but once the what app txt appeared I realised billy was in touch with [spoiler removed]. The fear reminder me off a real life case many yrs ago was that based on the story line. Did you base norton house in the treatment on Prudhoe Hospital as both in Northumberland as in the book the character Lacey is at drew school but then she turns up at norton house but how did she get sent there as nothing in book to say. But overall the books are excellent and page turners it’s hard to not sneak a look at the end so look forward to the next book. Hi Barry, thanks so much for taking the time to get in touch. I am so sorry for the loss of your mother. Grief is so hard. Thank you for your kind words about my books, well done for guessing who dunnit in The Missing (I have hidden your spoiler in case it spoils another reader’s enjoyment). To answer your questions the hospital building in The Treatment was completely fictional but I based it on the derelict Barnes hospital near Manchester. Regarding Lacey, I didn’t mention why she ended up at Norton House but she was excluded from school (as a bully I’m sure she did something pretty awful). You are right, part of the inspiration for The Fear was the Jeremy Forrest case from a few years ago. I hope you continue to enjoy my books. All the best, Cally. Have just finished reading my first book by you, “The Escape” and thoroughly enjoyed it. Shall definitely be reading more. However, was intrigued by the fact that you mentioned Malpas in Cheshire as I went to the senior school there and my sister lives there, so I know it well. It’s such an insignificant little place that I can’t help thinking you must know someone who either originated from there or who lives in the area? Thanks for your kind words, Barbara. So glad you enjoyed The Escape. I lived in Chester as a student twenty-odd years ago but never visited Malpas. I looked it up on Right Move though, to see if my character could afford a house there. Just finished reading The Fear. Another brilliant read. I have read all of your books and I’m looking forward to the next one. Brilliant author. Hi Rosie, wow, I had to grin when I read that you know Wendy Messenger. What are the chances?! I do hope the owners of Priory Park don’t hate me for setting that scene there! I am so glad you enjoyed The Fear. Thanks so much for taking the time to leave me a message. Cally. I had to find your website to write a comment. I’ve never read any of your books until recently when I purchased The Fear. It was amazing I couldn’t put it down. And the twist at the end, wow!! I’m purchasing more books on amazon now. Such a great author you deserve all the credit. Hello Savannah, lovely to hear from you. I am so glad you enjoyed The Fear. I hope you enjoy my other books as much. All the best, Cally. Very happy to hear that, Karen. So glad you enjoyed it. Thanks Michelle, very happy to hear that! Started reading ‘The missing’ on holiday and could not put it down finished it in a day. Currently reading ‘the escape’ and can’t put it down either! Your books are honestly amazing, you are a very talented writer! Can not wait to read more of them! What a lovely thing to say. Your message just gave me such a boost. Thanks for taking the time to leave me a message, Courtney. The Fear was chosen as our latest Book Club read. I couldn’t put it down and read it over two days (but only because I started reading it late in the day). I’ve already told the others how gripping it is. We’re meeting again in September so I’ll try to update you on the feedback. I’m looking forward to discussing the questions from the back of the book with the group, and of course the book in general. Rollocking good read! Hi Julie, lovely to hear from you. I’m thrilled that The Fear was chosen by your book club and that you enjoyed it so much. I hope it results in some lively discussion! Love all your books… Cant wait till the next one! Thanks Claire, really happy to hear that! Hi! I l have just finished the Fear as well and absolutely loved it! But I was wondering about that ending as well…may I know the explanation as well?? Thank you! Glad to hear a new book is on the way. Just read the last 3 on holiday and have run out. Love that each of your books is so captivating and I don’t read as much as I should nowadays. Can’t put yours down. Thank you, Lisa. That’s a lovely thing to hear. So glad you enjoy my books and hope you’ll enjoy Sleep too! Thanks Kristina, so pleased to hear that! Hi Thomas! Lovely to hear from you. I am so glad you’re enjoying the Czech version of The Escape. I love my Czech publisher Domino – they have published all my books so far! The escape was an amazing book which i totally loved. Found it hard reading at the end thromy tears but what a great read. Thank you, Stephen. I’m very touched by your comment. Love reading your book the fear and the missing, couldn’t put them down, really had me gripped from page 1 .can’t wait to read the other books. Thank you for taking the time to drop me a message, Hazra. I’m so glad you enjoyed The Missing and The Fear. Literally down to your last 3 books The Missing, The Fear and The Escape. I’ve never been so gribbed to books where I’ve sat up all night till early hours finishing Then off. It was the not knowing what happens that was bugging me. Can’t wait for more of your books. I’ve now got my friend hooked on your books. Keep up the good work. Hi Jenna, your message made me smile. Thank you! So glad you are enjoying my books. Thanks so much for recommending them to your friends. Hello, having just read “The Fear”, I would just like to let you know the book is great. It kept me hooked and it made my break time during work a lot better. I’ll look forward to reading more of your books in the future. Hi Raymond, thanks so much for taking the time to drop me a message. I am so glad you enjoyed The Fear and that it entertained you during your work breaks. That’s lovely to hear. All the best, Cally. I love your books and I’m looking forward to reading this article. I’ve saved it so I can read in peace. Hi, and thankyou for “The Fear”which I have just finished. I couldn’t put it down, and loved it. I will look forward to choosing another one of yours and look forward to The Lodger. 😀 Many thanks again!! Hi Mandy, lovely to hear from you. So glad you enjoyed The Fear. I’ve just finished reading The Fear – first book of yours that I’ve read. Wow, powerful stuff – how have I missed reading any of your books? Will now definitely be on the look out for your other books. Thank you, Maureen. I’m thrilled to hear that. I hope you enjoy my other books. Oh, what a lovely comment, Mandy. Thank you so much, you just made me smile. I am currently sitting in my study at 19:12 on a Sunday evening trying to hit my word count for today and your comment was a lovely boost! Hello, it’s been weeks since I subscribed to the book club but have not received the copy of The Lodge. I am in love with your writing! Keep those books coming! Hello. Sorry to hear you haven’t received your confirmation email and link to download The Lodger. If you give me the email address you used to register I’ll look into it. Your message made me laugh, Jo. Thank you! I guess you need to go back to the library and get another of my books! All the best, Cally. P.S. Thanks for supporting your local library. Great! Just join the CL Taylor Book Club and make sure you click the confirmation email and it will be emailed to you. I’ve read every single book so far. It’s a very hard decision but my favourite, at the moment, has to be ‘The Fear’. I was blown away once I had made the connection with Wendy’s character. I can happily say you never fail to intruige me. What another fantastically gripping story !!! Thank you, Niamh. What a lovely comment. I’m so glad you’re enjoying my books. The Fear is definitely one of my favorites, not least because Wendy was so much fun to write. Thank you, Julie. I’m so pleased that you enjoy them. I hope you like Sleep too! I never normally read, but during time over Christmas I found myself looking for a book to pass the time. I am so glad I did!! I started reading ‘ The lie’ and literally couldn’t put the book down!. I finally have found an author that grips me from the first page untill the very last. So excited to read your other books. The hard decision is deciding what one to read next! Any suggestions? Hi Cally! I’m a new fan of yours (from Australia) and I wanted to applaud you for your young adult novel ‘The Treatment’ which is the first of your books I read! I could not put it down! Thank you for sharing your amazing talent as an author with readers like myself. I was honestly gripped from the first page and I LOVED Drew as the protagonist with her fighting spirit and fierce determination. Honestly I did not want it to end! I hope you continue to write YA books! Since then I have purchased three other books of yours (The Fear, The Escape and The Accident) and cannot wait to start reading them. Will DEFINITELY remain a fan and life-long follower of your work. You have such a gift for writing!! Hi Alicia, what an amazing message to wake up to. I’m so glad you enjoyed The Treatment. I absolutely loved writing it and didn’t want to leave Drew, Mouse and Mason’s world. I’ve written the first draft of a new YA thriller (a standalone) but haven’t been given a date for publication yet – maybe 2020 or 2021. In the meantime I hope you enjoy my other books. All the best, Cally. Just read The Missing. What a gripping compelling story. I became involved right from the onset. Full of emotions that swept through me as the reader. And characters you could empathise with. I became totally absorbed. And so many twists. I could not decide who ‘did it’. But on the revelation of Billy’s end, all fell into place. All characters odd/suspicious behaviour made sense. Thank you, Fiona. Your message made me smile. I am so glad you enjoyed The Missing and that I managed to keep the ‘bad guy’ from you! Sorry to bombard your site with yet another message, but I had to commend you on the three books of yours I read after The Treatment (…on that note I am SUPER EXCITED to hear you are writing another novel for young adults!!). I finished The Fear, The Escape and The Accident, all of which were amazing! They have the same edgy, gripping suspense that I loved in The Treatment and I came away thinking what an absolute pleasure it is to read the works of such an amazing author. You really are brilliant! I will definitely be getting The Missing and The Lie and really looking forward to Sleep once it is released in April (I think I will have to get a copy signed by you…it would be an honour to have)! Congratulations on all you have achieved so far as an author, you have so much to be proud of! What a wonderful message, Alicia. Don’t ever apologise for getting in touch. It’s messages like yours that spurn me on when I’m having a tough writing day! I am so glad you enjoyed The Fear, The Accident and The Escape and are looking forward to reading more of my books. Yes, in 2020 I’ll have two books out – a new adult book (probably in March or April) and my second young adult thriller in June. I finished the first draft of the Young Adult thriller and just need to tweak a few things before I deliver it to my editor and I’m 12,000 words into the first draft of the next adult book. I hope you enjoy Sleep – if you order a personalised signed copy from Max Minerva’s you will make me, and an independent bookshop owner, very happy! Thanks again for your message, Cally. I’ve just finished The Fear in less than 2 days, it was brilliant! A really gripping story which I just couldn’t stop reading! I can’t wait for my next one! Thank you, Alison. So happy to hear that. 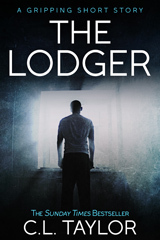 Is your book “The Lodger” out to purchase I thought I saw it on Amazon to purchase but then then when I went back a couple days later I couldn’t see it any more. I’m only asking incase I don’t win the competition so I can purchase it. Hi Lisa, The Lodger isn’t available to buy but it’s free to everyone who joins the CL Taylor Book Club so you’ll receive a link to download a copy, regardless of whether you win the competition or not. Do make sure you click on the email that arrives confirming that you signed up to it though or the email with the link won’t be delivered (sometimes the confirmation email ends up in junk boxes so you might have to look for it). Only recently started reading your books. I’m currently reading The Escape, it’s such a page turner. I also really enjoyed the fear, again another page turner. I was hooked from the off. I’ve read a few of your books, would love to enter the competition, but when I click on the link it says its not available. Actually I haven’t raed any of your novels uptill now but I am really excited to read your work. I have already ordered 2 of your books, The Missing and The Accident, and am hoping to order more as soon as possible, meaning to say when I have some money in my wallet again. And yes I will also be ordering Sleep when it’s released cause the title has just taken my mind. Thank you, Arushi. I hope you enjoy my books. Thanks Jase, really happy to hear that. The Lie is a lot of my readers favourite book. Hello, yes Mailchimp is the company I use to send out my newsletters. I am obsessed. There are only two authors I follow and read everything of, you are one of them. The way your words flow onto paper it’s amazing. I get so drawn in and have to finish as soon as I can. I read The Lie in 8 hours on a trip back from vacation. Hands down the best! Thank you, Chelbie, your comment made me smile, what a lovely thing to read. I’m honoured to be one of the two authors you follow. Who’s the other one out of curiosity? So glad you enjoyed The Lie. I think you’ll like my second YA thriller when it comes out next year as there are some similarities. Just finished Sleep and it was excellent. I had to keep reading but felt sad knowing it was going to end. I have read all your books and you just keep getting better and better. Thank you, Hazel. That’s such a lovely and encouraging message to read. I’m so glad you enjoyed Sleep. All the best, Cally. When people think I’ve published a book. I look forward to reading Sleep. Excellent initials, Coreen! All the best, Cally.